Are You Sitting in Ashes? Being depressed is like having a bloodsucking leech embedded in my flesh. Drains me physically. Muddles my mind. Squashes spiritual zeal. I can’t seem to detach the ugly thing. Ever been there? If you want to get technical, the dictionary defines depression as a psychotic state of mind that entails sadness, despondency, hopelessness, inability to think or concentrate, inactivity, and the desire to sleep. The verb, depress, means to lower. But oh, how I wish the Lord would rush to the rescue sooner, particularly for those I love. Because my ‘depressed spirit’ also resulted from concern and empathizing with so many family members and friends who are suffering far worse than me. If they were mentioned among the heroes of faith in Hebrews chapter 11, their woes would be listed as such: experienced the death of a child, unemployment, loss of a home, financial devastation, divorce, major surgery, lack of health insurance, life-threatening illness, agonizing chronic pain. Some of them remind me of Job. Sitting in a heap of ashes. Loretta learned to trust God’s sovereignty early in her marriage. Trusting God—no matter what—proved invaluable and enabled Loretta to cope when her husband died in a plane crash. Instead of becoming a missionary with her husband, as planned, Loretta became the sole breadwinner and single mom of three young kids. Over the next twelve months, three other beloved family members died. Can you imagine the pain? Today, as I emerged from my lethargic fog, I thought about Loretta’s words when I saw the yellow daffodils preening in my yard beneath a blue sky. Last week, these flowers were bent. Beaten down by the cold, pummeling rain. Now, the daffodils stand tall. Their stems stretch heavenward as they soak up the sun. If I close my eyes, I can almost hear them sing. Heralding the coming Spring. And a small voice whispers in the cool breeze. Trust God even in this…. Author Karen FosterPosted on March 3, 2017 Categories How to Cope with Pain, UncategorizedTags depression, despair, hope, How to Cope with Pain, lethargy, spring, suffering, trusting God, winter bluesLeave a comment on Are You Sitting in Ashes? A blue sky and the chatter of yellow finches clinging to the tube feeder beneath my Oak tree beckons me. Come out and play. However, blue skies can be deceiving in the winter. I open the front door and poke my head outside to test the temperature. The weatherman’s forecast was right. It’s unseasonably warm. I roll up my long sleeves. Grab a rake. But first, I stand still like the Tin Man from Oz and soak up the sunshine as though it were oil lubricating my stiff joints. 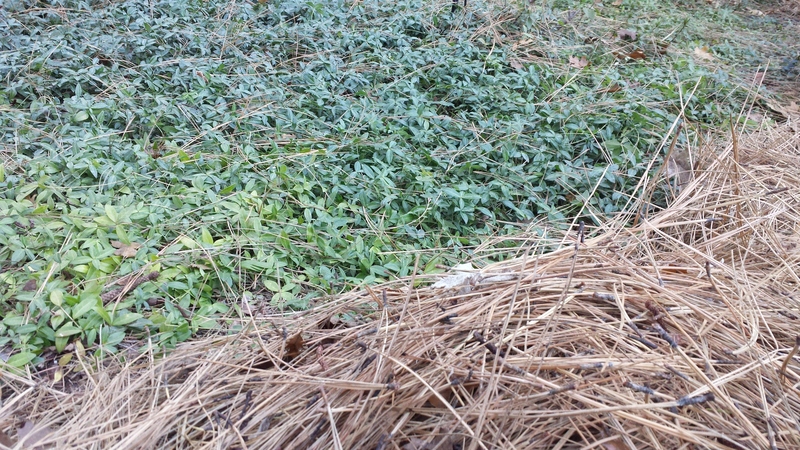 Then I rake the blanket of dry, brown pine needles off my Vinca plants. As sunlight touches the Vinca’s trailing stems, they seem to yawn and stretch skyward. Their miniature buds ready to burst into purple flowers. Can this really be January? Some folks may be envious especially if they’re shoveling snow. But as much as I love the sunshine, I’m praying for rain. Plants droop, waiting for a heavenly drink. Without rain, or snow in the mountains, the cost won’t be worth this week’s winter warmth. I rake sharp needles into piles and look for a God lesson even in this glorious Spring-like day. And He shows me how often I pray for perfect days. No problems to solve, nothing to fix. Health, wealth, and happiness. Isn’t that what people long for? Heaven on earth? But I’m no different than trees and grass. I need grey, wet days to grow and thrive. Left to my own self-protection, and idea of perfection, my character stagnates. As a believer, how can I grow more into the likeness of Christ if I cling to the sunshine and avoid the storms? I don’t have to be a weatherman to forecast my actions. I know I don’t pray as fervently when I’m on a vacation from my problems. I’m content to sail my own ship. Be captain of my soul. Do I want to grow in Christ, and have my character be more like Him? Then I must stop being a fair-weather friend. And rejoice even in the rain.